Centre for Lean And Six Sigma (CLASS) in association with MSME – Technology Development Centre, Agra offers certification programmes. SRM Institute of Science and Technology has organized a National Service Scheme - NSS Day Celebration in the Seminar Hall of MBA Block on 1st October 2018 at 9 am to 3 pm. SRM Institute of Science and Technology cordially invites all the students to be a part of the fantabulous celebration. Tamizh Academy is planning to conduct the talent test for the following Musical & Instrument categories. Those who have already experienced and trained can appear the test and get the certificates from Thamizh Academy. Tests will be conducted by the qualified Judges. Place: SRM Arts & Science College, Kattankulathur. Fees: Rs.1500/- for each category. Spot Admission. Tamizh Academy heartily welcomes all to participate and win. The Center for Lean And Six Sigma, in our belief in creating a professional work culture for the future and industry-ready graduates for tomorrow, wishes to poll your interest for the opening of a Toastmasters chapter at SRM-IST, Kattankulathur. Toastmasters International is an organization that believes in empowering individuals to attain excellence in skills that can create the Leaders the world needs. From public speaking to Team Management and Leadership Activities, skills necessary for every future professional are taught through discussions and experience by experts with many years of experience in the field. To receive these benefits, the Center for Lean And Six Sigma hopes to set up a Campus Chapter of Toastmasters, and requests your interest and cooperation to participate in the same. A demo session on Toastmasters chapter is arranged on 03 Oct 2018 (wednesday) 03 - 05 PM, ESB Seminar Hall. We invite students and faculty to attend this demo session. Cleanliness is most important for physical well-being and a healthy environment. a. One hour will be given for writing the essay. b. The language of the essay is English. c. The essay should be neatly handwritten on paper provided by the organizers. d. The word limit of the essay would be 1000-1500 words. a. The speech will be in English and not exceed 5 minutes in duration. b. The speaker is not allowed to read any part of the speech from papers, notes, etc. This workshop helps participants to understand Agile, DevOps, DevOps culture and Practices followed in software Industries. Software Professionals share their knowledge and experience of different organizations in both practical and theoretical aspects of Agile DevOps concepts. The objectives of this intensive workshop are to provide with the best practices to set realistic goals, estimate time & costs and about Continuous Development, Continuous Testing, Continuous Integration, Continuous Deployment, and proven techniques & tools. Last Date for Registration: 30 September 2018. Date of Event : 4 & 5 October 2018. The Department of Commerce, Faculty of Science and Humanities, SRM Institute of Science and Technology, Kattankulathur organized 5th International Conference on Business research with the support of the honourable Head of Department, Dr.Sai Chitra. The day had influential start with a tremendous inauguration by the chief guests, the guests were Smt. R.S. Isabella, Executive Director/MD In-Charge, REPCO Bank, Mr. S. Kannan, Commissioner, Central Board of Excise and Customs, Dr. AnkitKatrodia, University of KwaZulu Natal-Durban, South Africa and Mr. K. Ravi, Deputy General Manager, RBI, Chennai. The publications were released in E-proceedings and SRM Business Horizon Journal. Some of the papers were also published in UGC indexed/Scopus journal. The department had received 170 plus research papers and out of which 160 papers were selected for proceedings. The conference had many research papers from India, U.S.A, U.K, Sri Lanka, Ethiopia, Australia, Singapore to name a few. The conference saw 44 UG and PG students, 30 research scholars and 25 academicians presenting the paper. Smt. R.S. Isabella highlighted the importance of banking sector in India. She explained the growth of the Indian economy through the banking sector and how it's different from other countries. For instance, countries like the US and the UK have private sectors contributing to their economy. Mr. S. Kannan spoke about the advantages of GST reforms and also about the importance of knowing the fundamental concepts. Dr. Ankit Katrodia reiterated about the business cycle and how important it is to research on consumer behaviour before launching a product and how crucial an idea could be to earn money. Mr. K. Ravi briefed on the effect of demonetisation and how RBI is working on reducing the cost of printing new notes. He also stated the importance of investment decisions. Once the inaugural session got over, the conference went forward with the technical sessions. The presentation of research paper and academic sessions began at 11:30am at Mini hall I & II respectively. Technical session 1 of 5th International Conference on Business Research’ which is organized by the Department of commerce, In association with CIMA, Hrudya Adconser Pvt Ltd and Merx Mercis Students Association 2018 started at 1.00 after lunch and finished at 2.00 . This section was about finance. The 1st Chairperson of the session Dr. P.S Velmurugan, Dean, School Of Commerce and Business Management, Central University of Tamil Nadu, Thiruvarur, gave valuable speech to the participants about the importance and essence of finance in current generation, also about the scope and requirement of research in finance. Later he shared few real-time cases and tips for presentation of research paper and doing effective research. Then the section started and ended with 3 participants overall, each participant presented and finished it within the stipulated time. (5 minutes). There was 15 minutes snakes break after which our 2nd Chairperson of the session Dr. M. Jagadeeshwaran Assistant professor, School of Commerce. Bharathiar University, Coimbatore, spoke few words by motivating the participants and discussing their performance. This speech was so intense and motivating. This section was about human resource management. The 1st Chairperson of the session Dr. G.Anand Ganapathy, Director, Self Finance Course, The MDT Hindu College, Thirunelveli. He gave interesting speech to the participants about the new HRM polices, developments and key points where the participants can add on to their paper presentation. Later he started the technical session with a few interesting motivational stories. The section ended with 10 participants overall. As a final speech Dr.G.Subbulakshmi, Head, Department of Business Administration, St.Thomas College Of Arts and Science, Chennai spoke few words by motivating the participants which was so fascinating and beneficent and discussing their performance. The Technical session 3 was held on 09th October 2018. This session was based on the topic "Marketing". The presenters were expected to present their papers related to the topic "Marketing". The chief guest for the technical session 3 was Dr.Y.lokeshwara chowdary, Associate professor, PG and Research, Department of commerce, Government Arts College, Nandanam. He was introduced by Dr.dhurairaj Assistance Proffer department of commerce. The technical session 3 had a total of 9 presenters. They presented their paper in a very well manner and were appreciated by our Chief guests. Several questions were put forward for the presenter to answer. At the end of the session, vote of thanks was given by professor Jallaluden, Assistant professor, Department of commerce and a memento was given to the Chief Guest. This brought an end to the technical session-3. The 5th international conference came to an end on 10th October 2018 with a valedictory function. The Chief Guest Dr. E Suresh, Assistant Professor in Department of Economics of Gambella University from Ethiopia delivered a motivational speech on successful carrier growth. Felicitation speech was delivered by Dr L.Vijay, Professor in Department of Management studies, SA Engineering College encouraged students by related motivational stories about P.E.A.K (Profit, Ethics, Action & Knowledge) and also by Mr V Krishnamoorthy, Director of Hirudhaya Adconsor who congratulated all the participants and the organizers of the Conference. The conference came to an end with a Vote of Thanks by Dr. E .Sambasivam, Assistant Professor in commerce FSH, SRM IST who thanked all the people who organized the conference and thanked the Sponsors for their financial support for the conference; this was followed by the National Anthem. Theme: Young People and Mental Health in a Changing World. MF CME on Malaria Filaria-Conventional to Molecular and Epidemiological diagnosis. SRM Hackathon is a national level development event, organized by IT Association, which went on continuously for 36 hours from 12th to 13th October 2018. It brought together undergraduate students, graduate students, faculty, staff and industry partners. SRM Hackathon 3.0 witnessed a participation of a total of 35 teams. The developers had to build products that would lay a helping hand in building the future bit by bit. The registrations began on 12th October at 0900 hours in Mini Hall 1. Members of the association were present in Mini Hall 1 for registration and at various landmarks to guide the participants to TP Ganesan Auditorium. The team scanned the hack tickets of the participants and they had to show their identification proof after which they were given goodie bags and were guided to their respective tables for the event. The inaugural function was presided over by our honorable chief guest and judge Mr.Saurabh Jain, Vice President of Paytm. We also had Mr.Chandramouli, Associate Director of Accenture and Aravinthakash, Mobile Practice Head from Avasoft. To guide the participants we had some very talented and experienced mentors-Mr.M Noordeen from ZOHO, Miss. Janani Balasubramanian from Sirius Computer Solutions, Mr.Shivkumar Iyer from ZED Digital, Mr.Thanish Batcha from Ford Motors Company, Mr.Aashish Vivekanand from Deep Identity Pvt. Ltd and Mr.Shenbaga Prasanna from Amazon. The chief guest addressed the gathering and prompted them to build products which would benefit the society. He also offered internships and job opportunities to the participants of the Top 10 teams. After the Chief Guest’s address, participants proceeded towards their respective seats. Followed by a brief pitching session where each team was given a minute to pitch their ideas, the theme and the technologies they would use. After this, the mentors divided the teams among themselves through mutual understanding followed by lunch and development phase. The innovations of the participants spanned across themes like sports, agriculture industry, education, E-commerce, finances, and betterment of the underprivileged and old. The development phase ended at 1500 hours on Day 2. The top 10 teams were declared soon after the end of idea pitching session with the judges, mentors and chief guest in the VIP room. After this, the top 10 teams pitched their ideas in Mini Hall 2 in front of the other participants and the organizing team. The judges and mentors, after a thorough discussion, declared The FutureTech as the winner, the idea of IrisPointer by Team Codezoned got them the 2nd prize and Satoshi's Kids, a team from SRM, was awarded the 3rd prize. The teams received cash prizes by the Chancellor in the form of a cheque of 75 thousand, 50 thousand and 25 thousand respectively. There were some special prizes too. Team SecureT received the One Man Army, Team Furious was given Wonder Women and UI CAN to Satoshi's Kids. The winning teams also received goodies like mugs and graphic T-shirts. Our sponsor, ZED Digital, also ensured job and internship opportunities for the teams who had built their projects on the theme transportation Track. The Head of IT Department, Dr.G. Vadivu thanked the mentors and judges for their guidance and for gracing the event with their presence. She also applauded the efforts of the organizing team for organizing SRM Hackathon professionally. The Vice-Chancellor, Mr. Sandeep Sancheti interacted with the participants and gave an inspirational speech followed by the Chancellor, Mr. T R Pachamuthu, who delivered the closing note and wished the participants good luck for their future endeavors. The end of the evening was marked by the felicitation of the judges and mentors. To Know more..
SRM Hackathon is a platform where participants unveil the developer within themselves and come up with viable solutions to solve real-life problems ranging from agriculture to sports and fitness to e-commerce. SRM Hackathon provides budding coders and developers with a platform where they can showcase their technical skills and then work upon them to come up with solutions of the different problems in various fields. The developers are asked to come and build their products that would lay a helping hand in building the future bit by bit. With several sponsors to its name, SRM Hackathon is a national level event inviting participants from various corners of the country. Ideas have to be submitted by 2nd October 2018, based on any one of the themes described on the website. Those lucky enough to get shortlisted will get an opportunity to participate in the 36 hours live event that will take place on the 12th and 13th of October, 2018 at Mini Hall 1 and Mini Hall 2. They will then work upon the submitted idea from scratch to transform it into reality. Developers from all over the country should get ready to put their brains to work, convert all the technical thoughts into reality and fight for the title. The winners will be awarded prizes worth 8 Lakhs and there would be numerous special prizes apart from the main prizes to be given to various deserving teams and individuals. To know more. National Level Seminar on "Applied Economics"
The workshop is open for students, research scholars, postdoctoral fellows, faculties, and scientists. 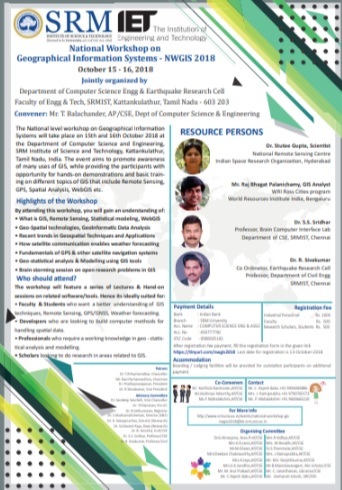 Please send a short CV mentioning about your qualification, current designation, and research interests with a subject line "Application for NWDP" to srmdbt@ktr.srmuniv.ac.in. Shortlisted candidates would be intimated along with registration form and payment details by email. Last date for registration - October 05, 2018. Organized by SRM School of Management, SRM Institute of Science and Technology & EDI, DST-NIMAT, Government of India. The event aims to promote awareness of many uses of GIS, while providing the participants with the opportunity for hands-on demonstrations and basic training on different topics of GIS that include Remote Sensing, GPS, Spatial Analysis, WebGIS etc. Last date for registration - 13 October 2018. Next day to the Convention on 19th October, Awareness Cycle Rally with the active Participation of Students and Society enthusiasts was flagged off by Ms. Amudha, Director – Food Safety Department and Kanchipuram District Collector Mr. Ponniah, IAS at Mahabalipuram. Pan India Cyclothon created awareness among Public about the importance of eating Healthy Foods – EAT HEALTHY. EAT SAFE. EAT FORTIFIED. “Cognitive Computing” is an elusive term used to describe a broad spectrum of techniques that provide a realistic way to achieve Artificial Intelligence (AI). It combines a wide variety of different techniques such as machine learning, data science, natural language processing, computer vision, human-computer interaction and so on. This 5-day ‘Faculty Development Program (FDP)’ explores different perspectives of Cognitive Computing Systems (CCS) that include Human-Computer Interaction, Data Science, Deep Learning, NaturalLanguage Processing (NLP), and Computer Vision. Development of various wireless and information technology techniques brings lot of applications to operate using Internet of Things (IoT). This requires the deployment of many numbers of electronic devices consisting of miniature application specific integrated circuits (IC). Some of the challenges include security in the network while processing and low power consumption of IC. Due to the emergence of hand-held and wearable devices, manufacturing of an electronic gadget with high-speed computing and low power consumption brings lot of challenges in the electronic industry. Among the various manufacturing process for these applications, 3D IC designs has attracted the researchers due to its ability to shrink the two dimensional technology on various stacks. This brings lot of new physical design challenges and need for electronic design automation environment. SRM IST, Kattankulathur – 603 203.